= Mammillaria crinita subs. duwei f. cristata hort. Description: The standard Mammillaris duwei is a well known small cactus that appears above the ground as a squat, spherical stem, completely covered by tight pubescent spines. 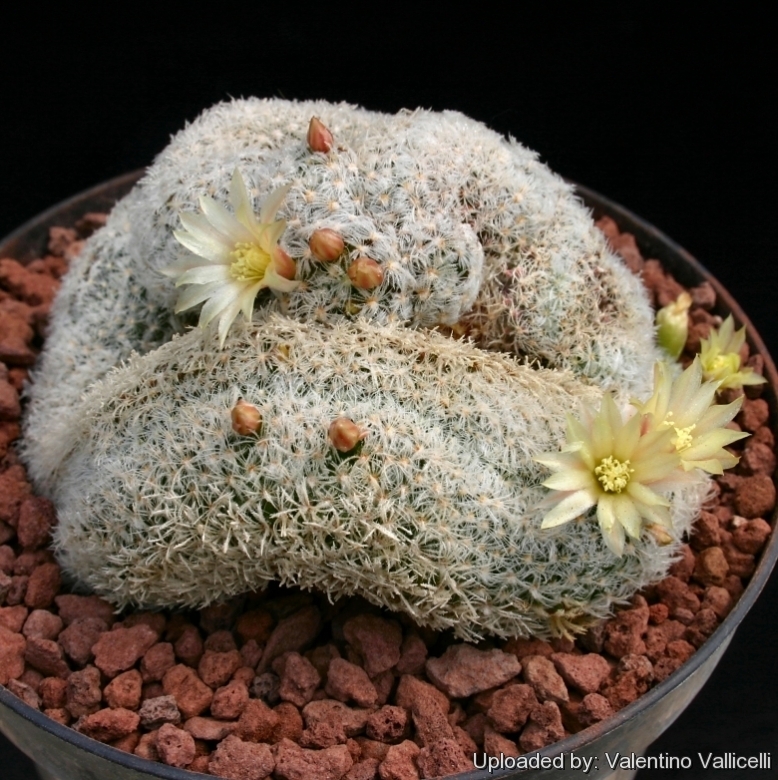 The crested form (Mammillaria duwei f. cristata) - despite to its beauty - is still very rare and sought after by collectors, for its unique features. Habit: It is a small low growing crested cactus that will slowly forms tangled groups up to 20 cm in diameter. Stems: Fan-shaped about 3,5 thick, dark green, soft, globoid, flattened-globose, to shortly cylindrical. Tubercles: Small, clavate 4-5 mm high, With a woolly axil and little hair. Central spines: 0-1 or 2 (occasiaonally 4). The long central spine is not present on all the clones, yellowish, hooked, to 8 mm long, pubescent. Radial spines: 28-36, acicular, thin, white, brownish at base, pubescent, 3,5-4 mm long, interlacing and densely wrapped against the body of the cactus. Flowers: Funnel-form, less deeply set, yellowish/cream to light yellow, about 20 mm long and in diameter. Inner segments lanceolate, widely spreading, accuminate, style and stigma lobes greenish. Blooming season: Flowers readily, and for a long period from spring to the early summer. Fruits: Light red to red, elongated. 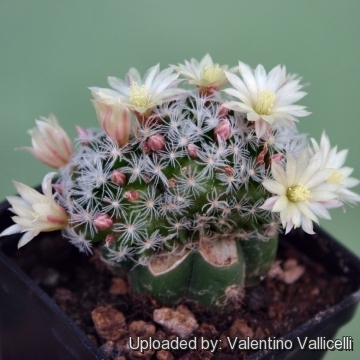 4) John Pilbeam (1999) "Mammillaria The Cactus File Handbook"
Cultivation and Propagation: It is regarded as a choice and difficult plant andgrows quite slowly. It is usually seen as a grafted plant but can grow on its own roots too.